Listeria monocytogenes surveillance requires robust laboratory support in detection and organism characterisation. Such laboratory support includes ensuring all relevant isolates are secured and uniformly typed to allow detection of clusters and attribution to potential source. Different typing have different strengths. The move toward sequencing of the whole genome and its subsequent analysis although presenting new challenges to laboratories and practitioners receiving the outputs alike is proving of great utility by providing information of genetic distance between isolates. Australia has established surveillance integrating laboratory typing with epidemiological information relating to human cases. Extending this model to include the potential sources of L. monocytogenes does and has led to early detection of sources thus mitigating the risk to all stakeholders and vulnerable consumers. Primary diagnostic and jurisdictional public health laboratories from all sectors provide crucial information informing Listeria monocytogenes surveillance in Australians. Listeria spp. are Gram positive, facultative, non-sporing bacteria which we commonly find in the environment (soil, water) and in food processing premises. Infections can result in gastrointestinal or invasive disease (septicaemia, meningitis). Listeria monocytogenes is the species most commonly associated with disease although there are reports of infections caused by L. ivanovii, L. seeligeri, L. welshimeri and, in recent times, L. innocua. Listeriosis is a fairly uncommon infection affecting elderly, the immune-compromised, pregnant women and their fetuses, and, neonates. Listeriosis is not a common infection. The rate of listeriosis in Australia is estimated at 3 per 100,000 (OFN 2010 annual report). However, the case-fatality rate for listeriosis is high, at 20–30%1. Foodborne transmission of Listeria monocytogenes was established in the early 1980s2. Since then, a variety of foods ranging from ready to eat sliced meats, dairy products, seafood, fruit and vegetables, and even butter3 have been implicated as vehicles for transmission – especially when multiply handled. Foods associated with high profile outbreaks in Australia include pate, chicken wraps (2009) and soft cheese (2013). Food manufacture and distribution practices means that food produced by a single factory and perhaps of the same batch, can be distributed widely. A contamination event may have wide geographic impact over a period of time. Listeria monocytogenes infections of humans are notifiable as are detections in food in some jurisdictions. Human strains are uniformly referred to jurisdictional public health (PH) laboratories for further characterisation. Coverage is complete. Non-human strains are sourced from targeted initiatives, sporadic isolations and investigations. Coverage is opportunistic. Methods used for typing include PFGE, serotyping (antisera or “molecular”), binary typing, MLVA, MLST, Riboprinter ribotyping and more recently next generation/whole genome sequencing (NGS/WGS). There are other variations on these tests but they are alternatives rather than additional. Of these, it is PFGE which has had the greatest Public Health surveillance utility – such that MDU has so-typed over 3,500 isolates since the early 1990s. Binary typing is readily and rapidly performed but shows less discrimination than PFGE. Similarly, molecular serotyping. Binary typing and serotyping may be useful in ruling particular strains “out” of a particular investigation, but usually do not definitively rule as “in”. MLST is time consuming, relatively expensive and more useful at a broad level rather than in finalising views on particular attributions. Riboprinter use is insensitive and largely discontinued locally. PFGE for Listeria monocytogenes has proved an excellent tool for discrimination and attribution. Centralising testing has not been problematic as numbers are relatively low. MLVA performs similarly to PFGE and may prove easier to standardise – although this can be harder than it seems. It seems inevitable that using NGS to determine phylogenetic relationships will replace all of the above – with some of the existing parameters utilised still being derivable. MDU has now sequenced over 200 isolates and NGS does indeed look promising. The NGS issues will include, for example, for SNP analysis, choosing comparators within lineages, accessing bioinformatics expertise, analytical algorithms and presenting the data to public health practitioners. As numbers of cases of Listeria monocytogenes are relatively low, we now believe we have these issues in hand. It may be that the laboratory analysis and reporting will focus more on cluster and attribution identification via comparative reporting rather than isolate by isolate reporting. NGS is particularly useful in addressing “when is the same the same?” – as needed in attribution assessments. An understanding of the rate and nature of changes over time of the apparently relatively stable Listeria genome under different selection pressures has been gleaned to address the all-important question during or preceding investigations of “when is different different”? When strains are “different”, they do not need inclusion in the relevant investigation. This question still proves challenging in day-to-day considerations and it remains critical to always interpret typing in the particular epidemiological context. Typing results are made known to senders, jurisdictions and OzFoodNet (OFN). Analyses of these results takes place at laboratory, jurisdictional, industry and national levels. This is best done when a One-Health approach is used. Human data (epidemiology and laboratory) is centrally collated by OFN who regularly analyse and feed-back to jurisdictional stakeholders. An exposure history using a standardised national questionnaire is performed for each case where possible with data being entered into a national database. This is a very sensitive national strategy – even challengingly sensitive as very small clusters (3 or 4) may be identified, and identifying which are “over” and which “the start of something” is constantly under review. Recent food recalls including those involving multiple jurisdictions have been identified by these means. When there is a problem evident and it is confined to that jurisdiction, the investigation is conducted locally. When problems are multi-jurisdictional then OFN instigate a structured “Multi Jurisdictional Outbreak Investigation” (MJOI), which informs next steps at the various food safety management levels, including internationally where relevant. We know what we know and we know there are things which would be helpful to know, but we don’t know them – e.g. which strains normally reside in which industry sectors. The competing interests of risk assessment, privacy, resource allocation and desired approach (collaboration vs regulation) are always to the fore. Currently human data are comprehensive and uniform. Timeliness is challenging given the potentially long incubation before disease (especially in maternal/foetal cases). A strong case can be made that every isolate made from a food which reflects potential human exposure, whether the food is recalled or not, should be forwarded for typing to detect early leakage into humans. A case can similarly be made with respect to isolates from high-risk foods’ production environments. It is helpful to know strain prevalence by sector as this information can ensure that results are not over-interpreted. Given the human, financial and reputational cost of contamination events and associated recalls, further development of collaborations across sectors backed up by Regulation and Industry Guidelines – when necessary or helpful in mitigating adverse outcomes – continue to be the optimal approach. FAO/WHO Microbiological Risk Assessment Series (2002) Risk assessment of Listeria monocytogenes in ready-to-eat foods: interpretative summary. 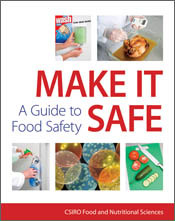 http://www.who.int/foodsafety/publications/micro/en/mra4.pdf (accessed 23 January 2013). Geoff Hogg is Director of the Microbiological Diagnostic Unit Public Health Laboratory. His role includes ensuring that laboratory services meet the needs of all those relying on them. He has a diverse background leading to a firm belief that where organisms and the diseases they cause involve multiple sectors, such as is evident for Listeria and Listeriosis, that a One-health approach is required to meet the needs of all stakeholders, including mitigating risks to patients. Agnes Tan is a Senior Scientist at the Microbiological Diagnostic Unit. She has assisted public health colleagues in outbreak investigations over many years. Joy Gregory is the OzFoodNet epidemiologist employed by the Victorian Department of Health. She has been with OzFoodNet since its inception in 2000. Joy has a keen interest in surveillance and epidemiology of enteric diseases, especially those with a foodborne mode of transmission, and has been involved in investigating numerous foodborne outbreaks including multijurisdictional outbreaks of listeriosis. Joy has a strong commitment to working in multifaceted teams during investigations to achieve the best public health outcomes.